If you have kids or pets, your furniture is probably covered in stains and marks, like mine. Give your room a new, fresh look with one of these beautiful stretch slip covers. If your couch still looks good, a slip cover can also be used to protect it from future spills and stains. 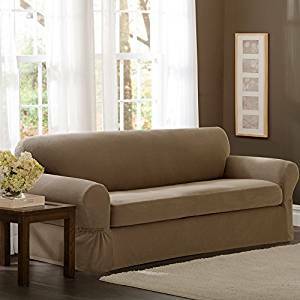 Stretch 2-Piece Sofa Slipcover – just $42.55 (regularly $109.99) – WOW! Stretch 2-Piece Loveseat Slipcover – just $42.55 (regularly $99.99) – WOW! ===> ORDER your Slip Covers TODAY! Disclosure: Prices are reflected at the time posted. Prices may change at any time. I may receive affiliate payments when you click on the links included in this post. This helps to offset the cost of running and maintaining a blog. Thanks for your support!